You will see from the attached correspondence that we have chatted before re my trolley problems. Does the cable shown on your spares website fit this trolley? Do the six connections come already crimped and do they come already fitted to the connector? If not do you provide the connector? It looks like this is sealed with clear silicone, will I have to seal the fittings when I replace the cable? What is the easiest way to fit the main cable through the trolley from the power unit to the PCB? As regards your symptoms, I would almost 100% say it is your click here; rotary speed control switch that is causing the problem at the moment. The controller box has a cable of wires running from the box to the main wire connector. Down the middle of the golf trolley is a main wire, this connects the handle circuit board (PCB) display to the controller box . The controller box connects up the battery power wire, the motor drive wire and this main wire which delivers the PCB controls. I hope this makes sense and makes it a bit clearer as to how the electrics in the golf trolley work. Have a look at the support page on the website and this goes through some of the electrical faults and remedies for fixing the golf trolley. There you will find many but not all the details which may shed light on your golf trolley problems. If you can figure out where the break is I can help. Attached is a photo of the controller and its respective connections. The speed controller on my Stowamatic is playing up, two things are happening.. Firstly the double click function on the right hand button is not working, doesn’t remember the last speed set, so need to turn the speed controller back to zero and reset the to desired speed, say 5. Second thing is that after speed is rest the power is cutting out completely, so have again have to go through a re-start…. Help! Difficult to determine which component is playing up. I couldn’t say for certain but the controller does a lot of the work. The display usually goes wrong when it malfunctions but not always. So either the PCB handle circuit or Controller. Keep a check on the battery lead connection if the whole thing cuts off. My Stowamatic is stuck on top speed. it switches on and off alright and the controller goes from 1 to 7 but even on one its in top speed. which part needs replacing. It is possible if turning the speed control switch does not change the numbers on the display then it is most likely this component needing replaced. If however turning the speed switch does move the LED display numbers up and down from 1 to 7 but the trolley is moving only at top speed I would think it is more likely to be the controller. The handle circuit can not be ruled out though, as when these handle circuits go wrong it can cause all sorts of symptoms, but more likely to disturb the display etc. I would check your controller and if it is the same model of circuits as we sell. We do sell some of the Stowamatic type controllers, just check your handle circuit to make sure it is the same as ours on the store. Sold with the controller in the drop down at ‘add to basket’. The handle of the trolley lights up indicating power to the unit but when the speed selector is turned, the wheels don’t rotate and the trolley doesn’t move forward. Also the set distance buttons don’t move the trolley. The circuit board is working. The speed control switch is working. With the controller box replaced and with the LED lights coming on shows at least some power is getting through, I presume the lights don’t go off when trying to move the trolley forward under power, as this would suggest a poor connection like the battery lead or other connection. Listening to the control box unit under the battery tray it should make a small click at the point of switching on the drive to the trolley. If there is no movement I would check the control box connection to the motor, making sure the power is coming out the control box wire going to the motor. 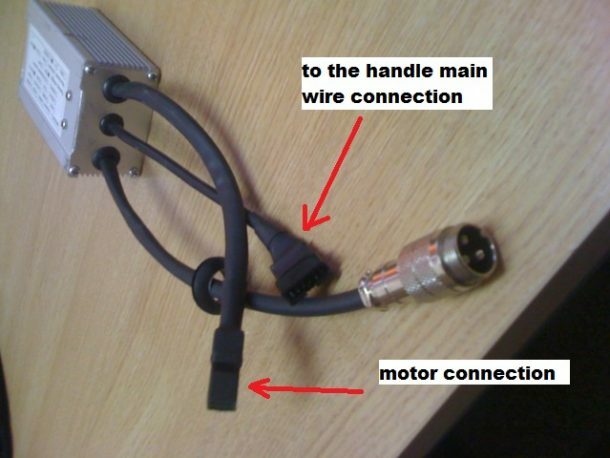 If there is power coming out the control box motor wire connector, then it is down to the motor where the fault must lie. For testing the motor without bringing an electrical tester to the control box motor wire terminals, in order to find out if its passing a current to the motor, a less technical way of testing the motor, is to smell it. There are more occasions when the motor is burnt out than malfunctioning. Hope this sheds more light on the fault.